CE Center - Move It! Discuss the importance of physical activity for developing bodies and brains. Describe the strategies outlined in the Physical Activity Design Guidelines. Explain how the designs of the three featured buildings encourage students to move during the course of the school day. 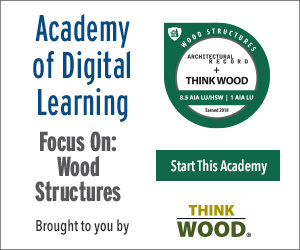 Describe design strategies for encouraging outdoor activity for schools on tight urban sites. Brain power is physical. Just as exercise builds a child’s muscles, bones, heart, and lungs, so it builds the brain, fueling cells with oxygen, nourishing connections between neurons, and supporting new neuron growth. Yet only one in three American children is physically active daily; fewer than one in seven walks or bikes to school; and, according to a new study from Harvard University’s T.H. Chan School of Public Health, over half are on a track that will lead to obesity by the time they are 35. Schools, where kids spend up to half their waking lives, represent a major opportunity to develop children’s brains, and their health overall, by getting them moving. At Discovery Elementary (bottom left) in Arlington, Virginia, a “hedge” (top) includes child-size cubbyholes that can be occupied in numerous ways. Students can travel between floors on a slide (bottom right). Movement doesn’t necessarily mean sports or athletics. Research shows that activities of low to moderate intensity can affect overall energy levels and help prevent weight gain; just reducing the amount of time spent sitting, and breaking up that sitting time with movement, makes a difference. Even so, a 2011 study of activity levels among 8- to 11-year-olds over the course of a school day found they were sedentary for 70 percent of class time, including gym class, and most were also inactive during recess and lunchtime. Aiming to do better, three recent K–8 schools—Discovery Elementary in Arlington, Virginia; Northland Innovation Center for Students in Academi¬cally Gifted Education (SAGE) in Gladstone, Missouri; and St. Hilda’s & St. Hugh’s School in New York—use design to foster less sedentary behaviors. 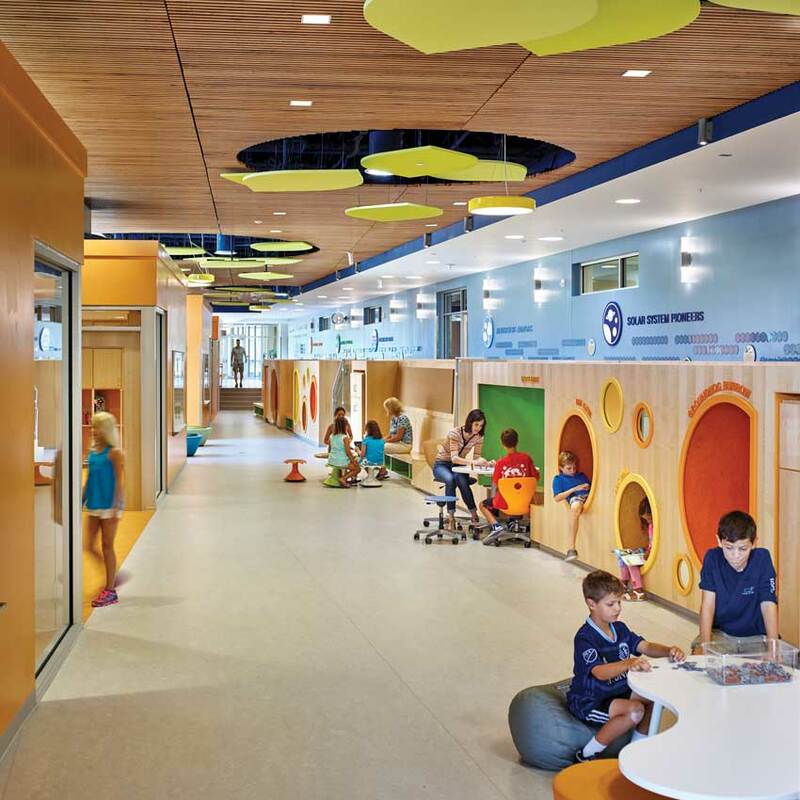 Discovery Elementary, a 98,000-square-foot net zero energy school, implements lessons from the experience of its architect, Charlottesville-based VMDO, on an earlier, health-driven project, Buckingham County Primary+Elemen¬tary Schools, in central Virginia. That project gave rise to Healthy Eating Design Guidelines for School Architecture, adopted by the Cen¬ters for Disease Control and Prevention and, more recently, the complementary Physical Activity Design Guidelines for School Architecture. Immediately inside the main entry, the floor level steps down 30 inches; a guardrail-height millwork partition known as the “hedge” separates the two levels, enclosing the kindergarten zone’s “backyard.” The hedge, which is up to 4-feet deep in some places, is populated with child-size cubbyholes that kids can discover, claim, and use in various ways. The architects expected these opportunities to climb up, crawl under, slide down, or adopt an unusual posture while working to be “just a little-kid thing,” says Wyck Knox, a principal at VMDO, but even fifth graders have started dropping by the hedge when the kindergarten class is outside. Throughout the building, features such as seating steps for story time, entire walls that serve as Scrabble and Lego playing surfaces, varied and adaptable furniture, and flexible spatial configurations provide opportunities to incorporate movement into the day. Choosing between a grand stair and a yellow slide between one floor and another is not a privilege or reward, “it’s simply a choice,” says Erin Russo, the school’s principal. A priority for Russo is encouraging the school’s teachers to use the building as intended: to take story time upstairs in Cloud Commons (a bright, open multilevel space that can serve as an informal amphitheater or as a group workspace), to make a presentation in a collabor¬ative workspace known as the Blue Sky Studio, or to let kindergarteners find their own reading spot in the hedge. Instead of relying on solid walls and partitions, designers differentiated spaces at the SAGE school in Missouri, with bright hues and changes in floor finishes.